Looks Good from the Back: Adrien: More Silk Shirt Nonsense. Adrien: More Silk Shirt Nonsense. I've never thought of button down shirts being my style, but something about silk softens the look and it's definitely more comfortable. 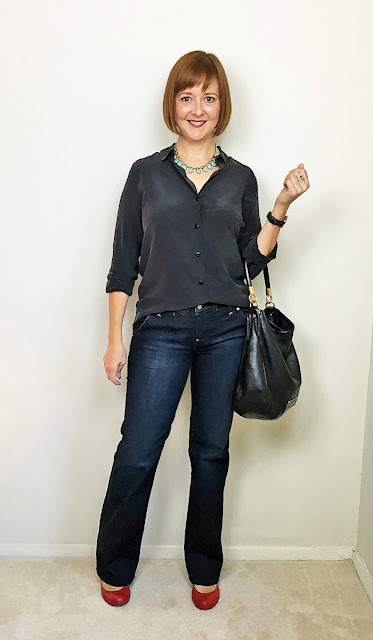 I'm happy with my simple Everlane neutrals but there are lots of beautiful silk blouses in colors I'd love to wear. This deep blue DVF blouse is so elegant and this pretty Ann Taylor blouse comes in a couple of interesting colors and oooh, bird cage print! I love that! And hey, you can't go wrong with Equipment silk, especially on sale. 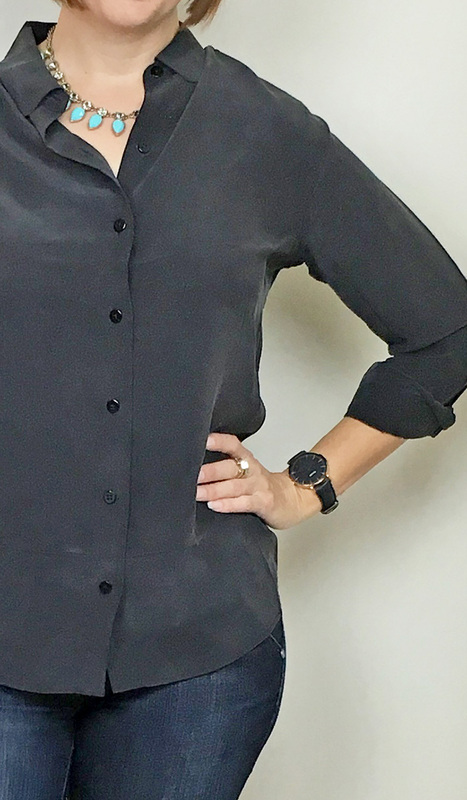 I love this sleeveless print blouse at Nordstrom and this long sleeved black silk blouse, both under $100. A closer look at my Everlane round collar shirt which I'm wearing with a J.Crew necklace that's quite similar to this one at JCrew Factory. I also love this pinecone necklace! The jewelry over at Factory is seriously cute right now. My watch is my usual Cluse La Boheme in rose gold, though I keep seeing this matte black version and oh. I love it. A quick bag-and-shoes shot. I've been wearing these a lot on the blog lately! My MBMJ Too Hot To Handle Hillier and my red Chie Mihara mary janes. Good red shoes are hard to find but this pair of Miz Mooz are a comfortable option or you can go full awesome with this Calvin Klein pair. Finally, because the weather has been so annoyingly fall-like, I've pulled my much-loved Eileen Fisher open cardigan back out. 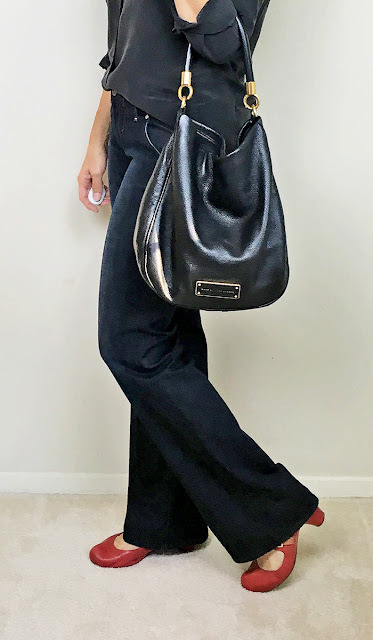 It was a bit of a splurge (even on sale) last fall but I ended up wearing it A TON. 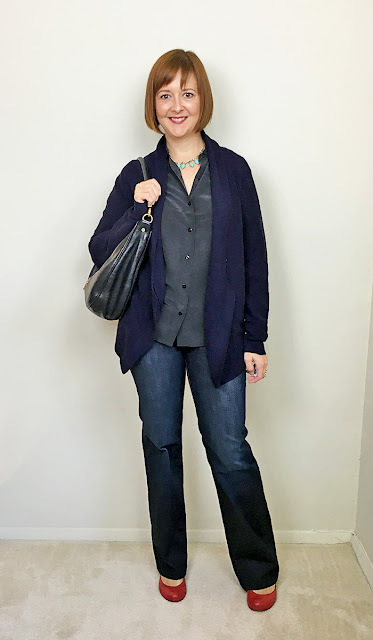 This petite EF cardigan looks a lot like mine and is marked down. I'll keep looking! Wine cardigans for everyone! This shirt is perfect on you! LOVE! It looks fab, especially half-tucked the way you have it in the first photo. 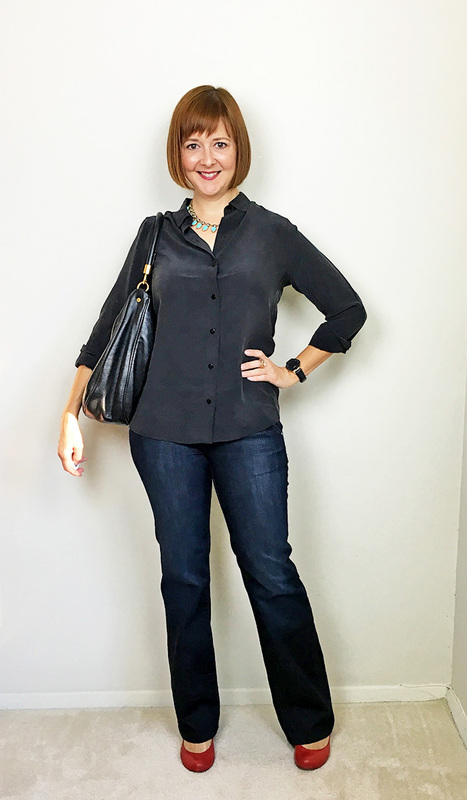 Love red shoes with dark denim, too! Weekend Window Shopping: Chelsea Boot Fever. Adrien: It Ends in Red Leopard. The Long Winter of my Discontent. The Ancient Monk Creme Verdict Is In! Weekend Window Shopping: J.Crew Final Sale Gold. Beauty: My Latest Obsession and a Story. Weekend Window Shopping: Old Favorites. Adrien: Pulling It Together With Stripes.